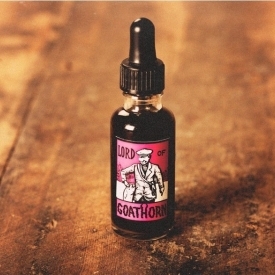 Inspired by a longshoreman known as the Lord of Goathorn, this is a distinctly marine-like fragrance. Its initial intriguing seaweedy smell turns to smoky lime and basil lifted on a sea breeze. DRF Alcohol, Perfume, Seaweed Absolute, Tarragon Oil, Basil Oil, *Citral, *Eugenol, *Geraniol, *Citronellol, *Limonene, *Linalool. This has to be one of the oddest perfumes I have ever smelled. Lush in Derby had just the one tester bottle in there today and so naturally I had to try it. I opened the bottle and thought it was vile when I smelled it a bit like creosote or something dead really awful. However I thought some of the other new perfumes had smelled a bit odd when sniffed in the bottle so I dabbed a goodly quantity on my inner wrist and then recoiled. The initial blast is truly powerfully foul. It smells like a wharf side with fish and seaweed, tar and ropes but pungent and rather yukky. I spent some time in the shop buying stuff and chatting to the staff as I always do and we all thought this was one we probably wouldn’t be rushing to buy. Some were more polite and said it was an acquired taste and maybe it was one you either loved or hated! They did offer to wash it off but I decided to leave it on and see if it changed at all. For at least half an hour the notes of tar and ropes still hung around but fortunately the fishier rank notes did fade after about twenty minutes. After about an hour the scent did improve and became quite licorice like on me. On my clothes the stronger notes still hung around a bit more but in fact it became far more acceptable after about an hour or so. Lush managed to create a distinctly atmospheric one here but not sure if it is one I will be rushing to buy. It is an acquired taste to say the least and I can’t see many people wanting to smell like an old fisherman really! Lush used seaweed absolute combined with tarragon oil and basil oil to create this one. I can’t imagine how tarragon and basil combined with seaweed to create quite such an odd aroma. If it was just seaweed then it wouldn’t be so bad but where did the tar and fishy aroma come from? This new range is not presented in the plain black bottles that we are used to in Lush perfumes. These are in clear square bottles and some are round classic bottles depending on the size of the perfume inside. The labels are quite different, this one is a deep pinky red and white. There is a man with a cap and a sack walking and he is in black and white. 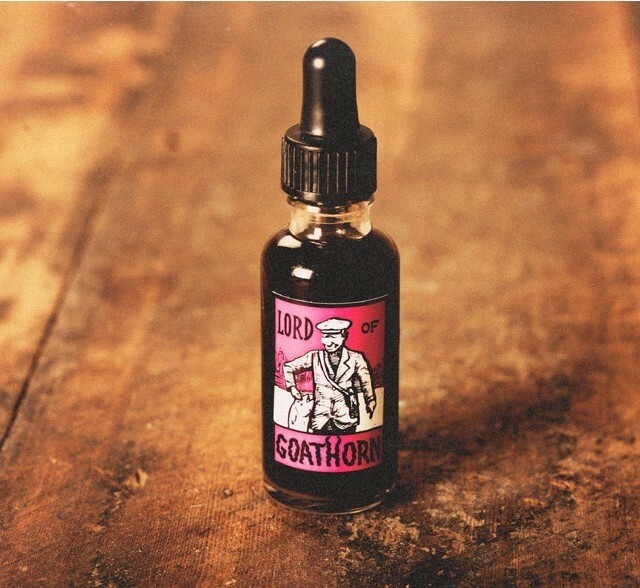 The name of the perfume is in black with ‘Lord of’ and ‘Goathorn’ below the picture. It is sort of retro cartoon style with the colours and certainly very different from the plain black ones of the original perfumes. They look a bit like mini liqueur bottles to me. The overwhelming scent that hits you in this one is the seaweed combined with fish and that of tar and ropes. After some time it does improve and the scent becomes one of liquorice which is much more pleasant, sadly you will have to put up with the bus emptying and everyone moving away from you before it mellows to the preferable liquorice scent. This is such an amazingly strange perfume and the odd scent lasted far longer than I wanted it to. The more pleasant liquorice aroma lasted until I washed it off that night. On my clothes it was the nicer scent that stuck fortunately so I didn’t have to wash my jumper the next day. This is one strong and powerful perfume and not one that you would need or want to top up at all during the day. The sillage I can’t comment on as I went straight home and by the time I got there it had calmed down a bit. Nobody actually recoiled from me but then nobody said I smelled nice either!! I am sorry all of you who are thinking of buying this as my Lush shop only had the tester bottle and it doesn’t seem to be available on line either despite being on the website so you will have to watch the Lush website with anticipation and wait patiently. I am quite sure this one will not appeal to many people. This is a unique scent and a very odd one too. I certainly will NOT be buying it. If you are in a Lush shop test with great care – you never know you might like it!!! This reminds me of strange liqueurs we have bought when abroad that atse disgusting when we get home. I love the fact that Lush create perfumes based on experiences but this is an experience I can live without!! I am struggling to think of one except it lasts on my slin! "This has to be one of the oddest perfumes I have ever smelled. Lush in Derby had just the one tester bottle in there today..."